This was my very first picture book. 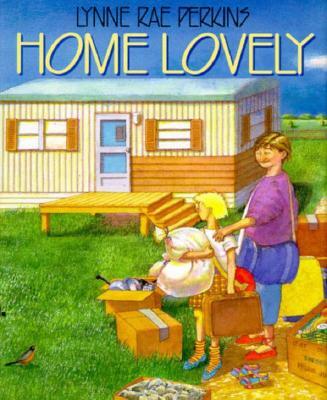 It’s the story of Tiffany, who moves with her mother, Janelle, into a mobile home in the middle of nowhere. Tiffany finds some seedlings growing not far from the garbage can and transplants them carefully alongside the driveway in front of the house, hoping to spruce things up. She is pretty sure they will be flowers, or even trees, and is deeply disappointed when Bob, the mail carrier, identifies the plants as potatoes, melons and tomatoes (sprouted from peels and seeds that didn’t make it into the can). But she is not sad for long. Tiffany and Janelle make a scarecrow. Together with Bob they enjoy BLTs made with the first ripe tomatoes, and Bob brings Tiffany a small flat of real flowers. A few other things happen, too. Maybe you will just have to read the whole book. “Can a seed really just fall on the ground and start to grow?” That’s what my first editor asked when she called to tell me that Greenwillow Books wanted to publish this story. It’s easy to laugh and say, “Oh, those people who live in New York City.” But I often find myself trying to remember exactly how certain things happen. As anyone who keeps a haphazard compost pile can tell you, seeds fall on the ground and start to grow all the time. Potato peels, the scooped-out insides of melons, and rotting tomatoes all sprout beautiful seedlings. Squash, including pumpkins, are good too. At an exhibit at the Great Lakes Children’s Museum in Traverse City that combined artwork from books, the books themselves, and related hands-on activities, a terrarium was set up to grow the three things that Tiffany finds growing next to her garbage can in Home Lovely. The terrarium was next to the pages from the book that show what the three types of seedlings look like as they grow. Prepare melon balls. Pour boiling water on gelatin in bowl; stir until gelatin is dissolved. Stir in juice and ginger. Refrigerate until slightly thickened (to the consistency of unbeaten egg whites) but not set. Stir in melon balls. Pour into 4-cup mold or 6 individual molds. Refrigerate until firm, at least 4 hours. Unmold onto salad greens. (To unmold salad, quickly dip the mold into hot water to the top of the gelatin. Loosen the edge with a paring knife. Place a plate on top and, holding tightly, invert and shake gently. Repeat if necessary. This recipe and the gelatin tips adapted from the Betty Crocker Cookbook, 1978 edition. Which also has really good recipes for meatloaf and pumpkin bread.